Antique - Hammersley & Co. China - "Asiatic Pheasants" Pattern #6908 - Ta Set with Polychrome Enamels - Made during 1887 thru 1932 - A (21) Piece Set, Service for Six. This Beautiful Antique Hammersley & Co China Tea Set is the "Asiatic Pheasant" Pattern #6908, Made in England, around the 1900's. This is a Pattern made for the Ovington Brothers of New York. 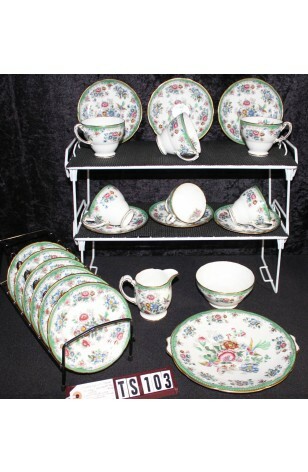 An Ivory Background China, with Multi-Color Florals of Pink, Yellow, Blue, Red and Rust, with Green Leaves, Pheasants, Green Lip and 22kt Gold Scalloped Rim. A Beautiful rendition of this Pattern and Unique in the colors. A service for (6) Six.